Home Health & Wellness Think. Good. Sometimes simply seeing, saying or hearing something can change your mindset. Music is great for that, but so is picking up the habit of thinking more positively. Because thoughts carry universal energy, changing our thoughts will change our circumstances. It could just be that our thoughts change our perception; either way, you will be in a more joyful place of being. Here is what I tell myself, over and over and over again until my perception is tilted back toward the positive. 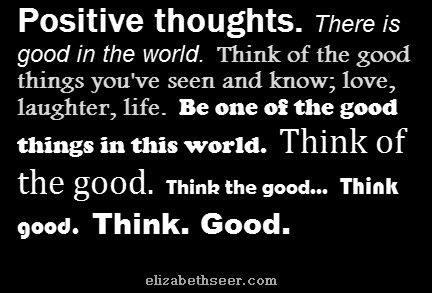 good thinking, good words, happy habit, happy thinking, positive meme, positive thinking, positive thoughts, positive words, power of positivity. Bookmark.